LOS ANGELES, Feb. 24, 2018 – The Make-Up Artists and Hair Stylists Guild Awards (MUAHS, IATSE Local 706) tonight announced winners of its Annual Make-Up Artists & Hair Stylists Guild Awards in 23 categories of film, television, commercials and live theater. 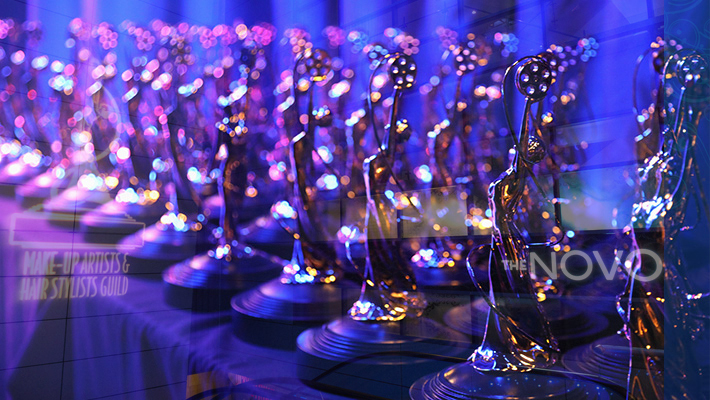 Winners in the film categories include “DARKEST HOUR,” “PITCH PERFECT 3,” “I, TONYA” and “GUARDIANS OF THE GALAXY Vol 2.” Television winners include “GAME OF THRONES,” “DANCING WITH THE STARS,” “THE CROWN,” “BIG LITTLE LIES,” “FEUD: BETTE AND JOAN” and “AMERICAN HORROR STORY: CULT.” Winners in the Daytime Television category were awarded to “THE BOLD AND THE BEAUTIFUL.”“HENRY DANGER” wins Best Children/Teen Program. Theatrical honors go to MAMA MIA and the Commercial/ Music Video Award was presented to AMERICAN HORROR STORY: CULT – PROMOTIONAL CAMPAIGN. For the first time, the annual MUAHS Awards Red Carpet was live-streamed from LA Live’s Novo Theater. See an encore at local706.org/live-red-carpet and americancinematheque.com/MUAHSLiveStream. Hosted by TV personality, actor and singer FRANKIE J. GRANDE, the MUAHS Awards “Live From the Red Carpet” was co-produced by IngleDodd Media , Honeysweet Creative and American Cinematheque. Oscar®-nominee GARY OLDMAN (Darkest Hour) received the Distinguished Artisan Award, presented by actor MALCOLM MCDOWELL (Clockwork Orange). Oscar-winning Make-Up Artist GREG CANNOM (Titanic, Mrs. Doubtfire, The Curious Case of Benjamin Button) was honored with a Lifetime Achievement Award by Oscar-winning Make-Up artist RICK BAKER. Eight Primetime Emmy®-winning Hair Stylist MARY GUERRERO (Dancing With the Stars, Hot In Cleveland) received a Lifetime Achievement Award from DWTS dance champion VAL CHERKOVSKIY. Guerrero’s longtime client BETTY WHITE could not attend the show, but prepared a video tribute in honor of the hair stylist. Presenters for this year’s awards included LILY TOMLIN (Grace & Frankie), ERNIE HUDSON (Grace & Frankie), TOM PAYNE (The Walking Dead), CARRIE ANN INABA (Dancing with the Stars), VAL CHMERKOVSKIY (Dancing with the Stars), ANNA CAMP (Pitch Perfect), MELORA HARDIN (The Bold Type, Transparent), JOE MANTEGNA (Criminal Minds), CHRISTOPHER McDONALD (Ballers, The Good Wife), PAUL SCHEER (The Disaster Artists, Veep, CHIN HAN (Ghost in a Shell), KATE LINDER (The Young & The Restless), MELISSA LEO (I’m Dying Up Here), KIRA KOSARIN (The Thundermans), KIRSTEN VANGSNESS (Criminal Minds), ROBERT PATRICK (Scorpion, True Blood), OLIVIA SANABIA (Just Add Magic), AMBER STEVENS WEST (Ghosted, The Carmichael Show), JACE NORMAN (Henry Danger), and CORBIN BLEU (High School Musical) among others. Returning again as producer of this year’s MUAHS Awards was ERICK WEISS of Honeysweet Creations. The Make-Up Artists and Hair Stylist Guild Awards is proud to be sponsored by DIAMOND LEVEL: M.A.C. Cosmetics; RUBY LEVEL: Ardell Professional, Inspired Beauty Brands Inc.; SAPPHIRE LEVEL: Glamcor, Nigel Beauty Emporium, Schwarzkopf Professional USA ; PREMIER LEVEL: Dermaflage, Focus Features, Netflix, Olivia Garden Inc., RCMA Makeup; PLATINUM LEVEL: Fox Searchlight Pictures, IATSE Local 798 Makeup Artists & Hairstylists; GOLD LEVEL: Showtime Network; SILVER LEVEL: Boxy Girl, Bright Event Rentals, Cine-Makeup Inc., Cinema Makeup School, I.A.T.S.E., Japonesque Beauty, Kryolan Corporation, Make-up Designory, Naimie’s, NYX Professional, Premiere Products Inc., Skindinavia Inc., The Criterion Group, Universal Pictures, Warner Bros Pictures; GIFT BAG SPONSORS include Beauty Blender, Brush Off, Hempz, IT Cosmetics, Jacque Mqido, Kat Von D, Kevyn Aucoin, Moroccan Magic, Schneider Entertainment, Senna Cosmetics Inc, Z Palette; MEDIA SPONSORS include The Hollywood Reporter, Variety, SHOOT, Los Angeles Confidential Magazine and American Cinematheque; IN-KIND SPONSORS: The Powder Group, Make-up Light, Hollywood Distillery. Get #MUAHSawards updates on FACEBOOK, TWITTER and INSTAGRAM.